Air Force Secretary Heather Wilson on Feb. 21 directed a team led by Air Force Maj. Gen. Clinton Crozier to develop an “initial work plan” to establish a Space Force under the Department of the Air Force. COLORADO SPRINGS — Congress may or may not enact a Space Force as a separate military branch. But if it does, the Air Force has a game plan ready to go. 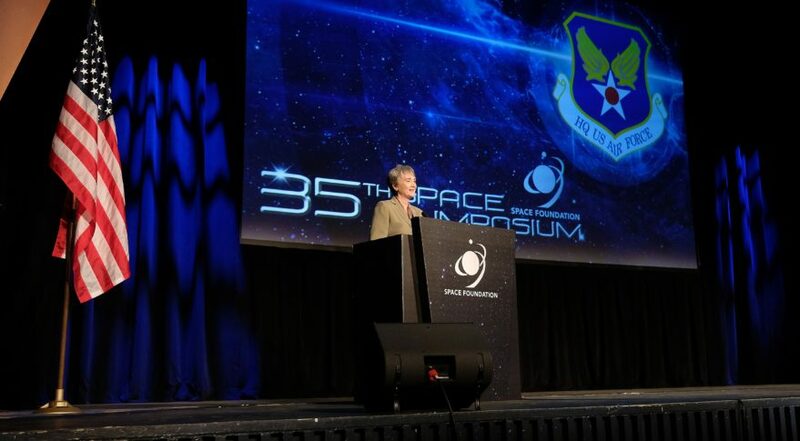 “The Air Force was given the task of planning for the establishment of a Space Force so we move out smartly” once Congress authorizes the new branch, Air Force Secretary Heather Wilson said on Tuesday at the Space Symposium. Wilson on Feb. 21 directed a team led by Air Force Maj. Gen. Clinton Crozier to develop an “initial work plan” to establish a Space Force under the Department of the Air Force. The plan was delivered to Acting Defense Secretary Patrick Shanahan on March 22. Wilson will be stepping down May 31 to become president of the University of Texas El Paso. A senior official told SpaceNews Wilson was closely involved in drawing up the Space Force plan and wanted to make sure it laid out a detailed transition. According to a draft of the plan obtained by SpaceNews, the 22-page blueprint is “the most detailed planning to date with respect to the establishment of the U.S. Space Force, and will serve as the guiding roadmap for all follow-on actions.” If Congress enacts the Space Force in the 2020 National Defense Authorization Act, the Air Force’s plan would kick into action Oct. 1, 2019. The initial work plan lays out the steps that would be taken to get the Space Force organized — starting out with the standup of the service headquarters at the Pentagon with about 200 people within 90 days or less, all the way to a “full operational capability” by 2024. The headquarters would be led by a four-star chief of staff, a vice chief of staff and an undersecretary for space. The plan only deals with the process of standing up the Space Force staff and an office for an undersecretary for space. It does not mention individuals who could be nominated for those posts or does it answer key questions such as the size of the force. Shanahan said he estimates the service would have 15,000 to 20,000 people. The Space Force plan would be coordinated with all military services and DoD agencies. The Air Force would first focus on transferring space-focused airmen to the Space Force before members of other services are transitioned over. The Pentagon’s fiscal year 2020 budget seeks $72.4 million for 160 personnel to stand up the Space Force headquarters (122 civilian, 38 military). The Air Force would seek additional resources to add 40 more people to the headquarters “but not to the point of committing resources that have not been authorized and appropriated by Congress,” the plan says. During the first year, Space Force leaders would figure out a preliminary “organizational design, which will include the permanent headquarters offices, subordinate field units, and mission support centers and agencies (Space Personnel Center, Space Doctrine Center, Space Intelligence Center),” the plan states. The Space Force proposal that DoD submitted to Congress keeps the costs down by forming the new service with existing personnel who would be transferred into the Space Force. The proposal seeks special authorities for the secretary of defense to move people, facilities, budgets and programs, and to hire civilian employees outside the traditional civil service process. Several lawmakers have said they will oppose giving DoD such authorities and have suggested that could be a deal breaker in any future negotiation. The initial Space Force staff will identify the “mission-unique equipment and real property that may or may not transfer to the U.S. Space Force,” the plan says. That would include space lift ranges, missile warning antennas and mission infrastructure.